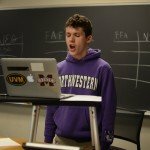 We are excited for our upcoming Chicago Debate Championship at Curie on Saturday, 3/30 and wanted to give you a place to find all the info you needed to know. Have a question not answered here? Contact us for help all this week! Students and teachers arriving in the morning should gather inside of the Auditorium. Breakfast is available in either of the first floor cafeterias (1E and 1W) on both Saturday and Sunday. Coaches should check in at the judge table near the auditorium and Tabulation Room (184) and receive your check-in folder. Your tab directors are our new Program Officer for School Support Flynn Makuch, 224-507-4881, and frequent tab director Matas Vaitkevicius, 630-312-9068. Please text changes to Lucia at 773-630-0736. E-mailing Lucia or our tab directors is also possible but text is preferred. 7:30 am – Registration opens and we will expect all changes in person or by text once you get on your bus. Please have your phone on in case we try to reach you. 7:50 am – Any schools that have not checked in (in person or by text) will not be on the Round 1 pairing and will be assigned forfeits. Note that we’re trying out a new system for a tournament as big as this one where we will send you a couple of important mass texts reminding you of these times Saturday morning. If you get a text from a number you don’t recognize, please check it since it’ll be about the debate tournament. Students waiting to be picked up should wait in the Archer Ave Entrance lobby. Students are asked to remain in eyesight of security personnel. 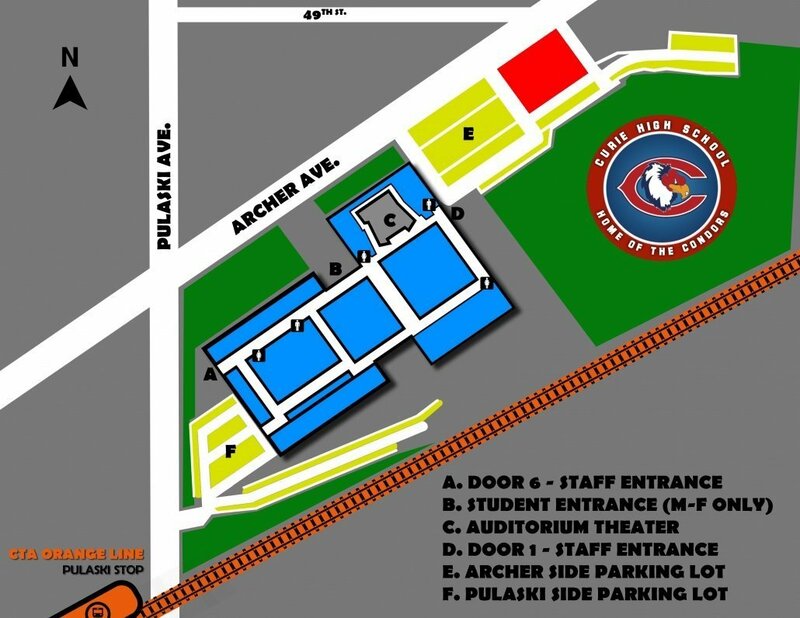 Curie High School is located at the corner of Archer Ave and Pulaski Rd, with a parking lot on each side. Please park on the southeast side of the building in the Pulaski Rd parking lot, and enter through the staff entrance (Door 6.) Upon entering security will direct you toward the Tab Room. Please park on the northwest side of the building in the Archer Ave parking lot, and enter through the guest entrance (Door 1.) Waiting buses are expected to park at the end of the Archer Ave parking lot. Please see map above. In order to maintain an orderly, respectful and secure environment it is essential that all visitors to our building be aware of their responsibilities and adhere to the rules. The Chicago Public Schools Code of Conduct should be followed while in the building. It is the responsibility of each schools’ debate coach to assure that the rules are met. No food permitted outside of the cafeterias. Students should be supervised at all times. Space, furniture, and/or equipment must be returned to original positions. Prohibited building areas: ‘B’ building second floor, pool, faculty cafeteria, unassigned rooms. Debate Coaches must stay in the building until all of their students have left/been picked up. Instead of one massive cafeteria, Curie has 6 smaller cafeterias (all near each other). In order to make sure there’s enough food and servers for everyone and to ensure that students have community, meet new people, and do not stick to their own conferences, direct your students for lunch and dinner to your school’s assigned cafeteria. Coaches and judges can get breakfast (coffee and pastries!) in the judge lounge in Room 192! We will use Speechwire Live, which you can sign up for and get e-mail or text blasts for pairings and your judging assignments. Please have debaters check under their doors for pairings for the next debate after Rounds 1, 3, and 4. We will print pairings on brightly colored neon paper when possible to make them easier to spot under the doors and on the walls. Caitlin Miller, the wonderful head coach at Jones, will lead a PD on how to use e-ballots at 7:30 am in Room 147! We ask coaches to make sure that starting at 8:10 pm, we start sending kids from dinner to the auditorium so we can start Awards on time and go home on your buses on time by 10 pm! If you haven’t already done so, please e-mail Mandela the name of your MVD so that we can recognize them properly and be prepared to honor them on Saturday during the Awards. You can find the Previewed Affirmatives outside the Core Files here. Please give your students a heads-up that we will have a few observers (funders, supporters, CPS leaders) who will watch parts of a few debates this weekend. They should debate as they would otherwise and only a few rooms will have observers, but we just want to give some warning so they’re not intimidated by having several adults in the room watching their speeches. If you have particularly nervous students who wouldn’t be suitable for being observed, please let David know. By the end of dinner on Saturday, please have your Varsity debaters sign up with April to judge Novice elim debates on Sunday if they are not debating themselves. We want the most reliable, enthusiastic young leaders you have on your Varsity to step up to help decide our Novice City Champions! Is your team freaking out about debating some of the top teams from other conferences? Are you nervous about what goals are realistic? Take a look at some of our advice on giving students a growth mindset coming into joint-conference tournaments and remind them that EVERY school will be recognized at Awards, including naming a Most Valuable Debater (MVD) for their year-long contribution to your debate team. Please note that our program staff will have a mandatory comp day on Monday, 4/1 following the tournament. We will happily follow up on questions and concerns after the tournament on Tuesday, 4/2, but none of our program staff will be online on Monday. We know you know how hard they work and we know how hard you work and how long a weekend it will be for you as well going into your own Mondays. We hope you will be able to rest as much as you can and appreciate the understanding for our staff’s day to recover and be at their best for you the rest of the week. Thank you, in advance, for your patience in our replies and for all you do for our great students. *Thank you to the Coaches’ Council, and in particular, Caitlin Miller and Robb Berry for stepping up to help us with collecting previews and judge philosophies.